Love flowers? Well, today I'm in kind of a flowery mood. I've got a couple of flower crafts that I'd like to try once we all start feeling better. 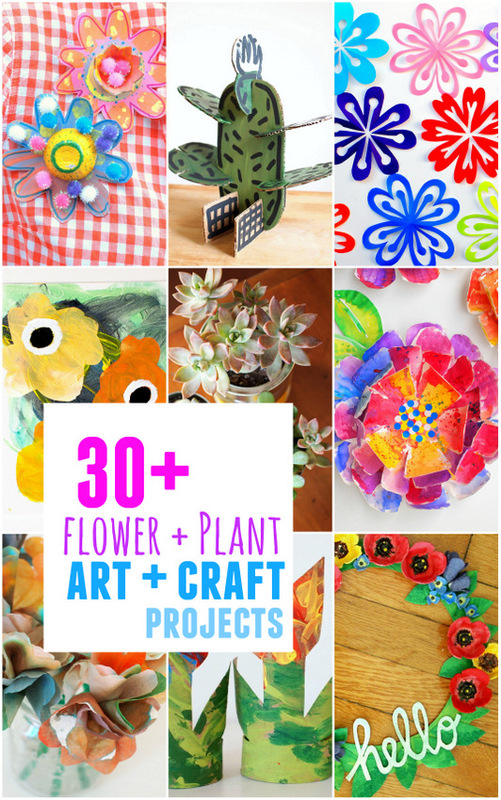 So until then, I've scoured the blog for our favorite flower and plant project ideas in case you're in a flowery, springy mood too! We've been eating a TON of eggs lately... which means that we now have material for another egg carton craft! (Yay, woot, woot. Or should I say... hoot hoot?) Today I'm sharing this super easy egg carton owl craft that I recently made with my preschooler. It's a great spring craft that doesn't require any special materials and is super easy to set up! Hoot hoot! Let's Make some Egg Carton Owls! I love seeing kids' homemade gifts. Don't you? There's something beautiful about receiving a gift made by tiny hands. 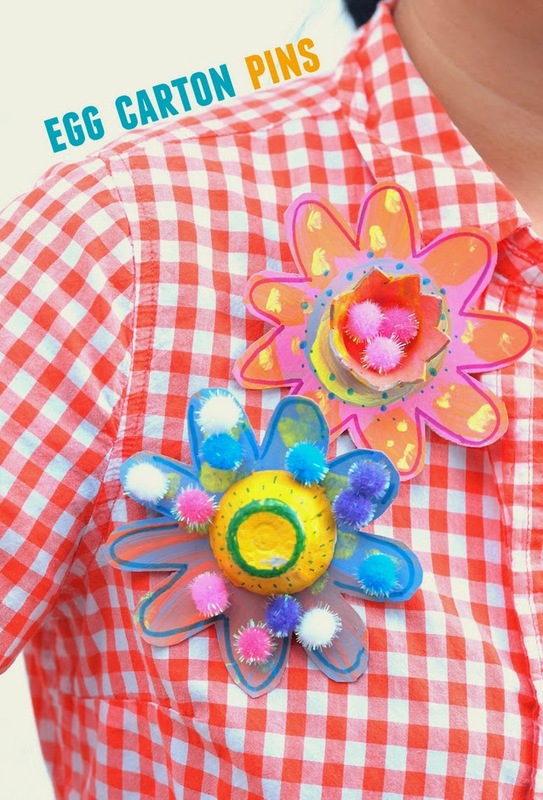 Today several kid-craft loving bloggers and I took on an egg carton craft challenge. We came up with different ways to craft with egg cartons. Since Mother's day is coming up next month, I thought it would be great to make some egg carton flower pins! Like our styrofoam mosaic tile picture frames, this craft turns "junk" into lovely gifted treasures. 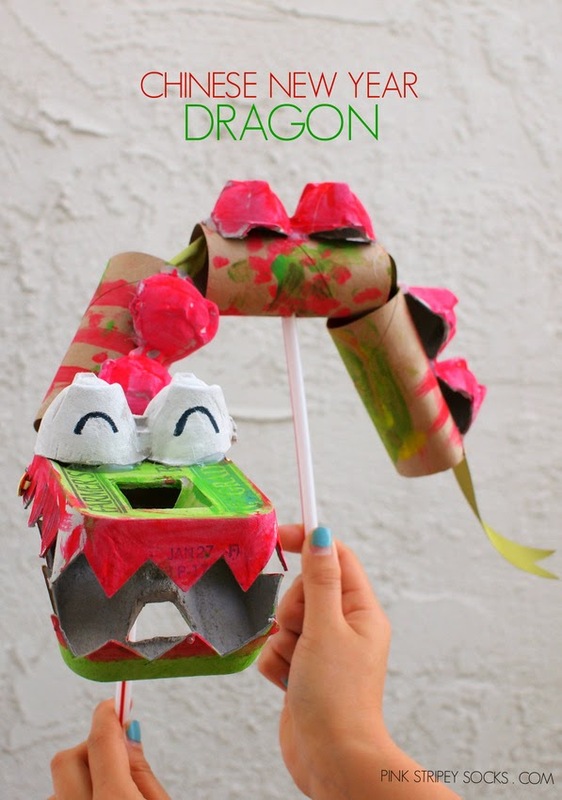 This year we're keeping with the dragon theme and making this Chinese New Year Dragon Puppet from recycled cardboard! It's an upgraded version of last year's craft because you can actually move this dragon around! Make a set of Shark Teeth! Lately Chuck's wanted to make cardboard toys that move and do things! That's fine with me, because I really enjoyed making moveable snakes, rocket launchers, paper slingshots, and climbing cardboard circus men with him. Currently he's OBSESSED with sharks. 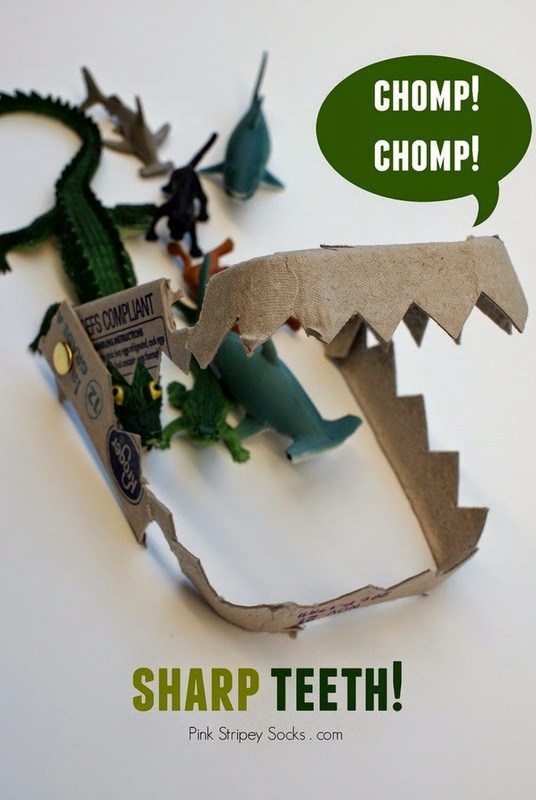 So I came up with this quick and easy egg carton shark craft. Make a set of Sharp Shark* Teeth! I hope you had an egg-cellent Easter. We had a really nice time eating and celebrating with our egg-stended family. Inspired by Krokotak's egg carton hens, I made my own chicken and ladybug egg holders. I also blew out a bunch of eggs, colored them, and then turned them into confetti eggs for our family Easter egg hunt. I used a safety pin and pricked the top and bottom of the egg. Then, I used the safety pin to enlarge the bottom hole. Then, I placed my mouth over the smaller top hole and blew the egg out over a bowl. Once the egg was emptied, I rinsed the shell out and left it to dry on a paper towel. I had much better luck dying the rest of my eggs. Hubby and I used masking tape to first create designs and then we dyed them. To create each color, we simply combined 1 cup of boiling water, 20 drops of food coloring, and 2 teaspoons of vinegar in a large mug. Then, we held our eggs in the dye until they took on the hue that we liked. Once all the dye dried (and the nail polish smell dissipated... yuck), I filled the hollowed out eggs with rice krispy treats (poured through a simple funnel made from rolling a piece of paper) and sealed up the holes with masking tape. The kids had fun finding these special eggs and stomping on them to reveal the rice krispies within. Although these eggs were fun to make, it was even more fun to see the kids smile each time they found a special "stomping egg." and therefore it is free. Today's crapting project is a Halloween inspired one. Our apartment desperately needs Halloween-y decorations. (We currently only have a pair of Day of the Dead candle holders) So, I whipped up a super easy Halloween garland out of an egg carton and string. 2. I painted the little egg holders orange and green. 3. Once my paint dried, I drew faces on my tiny pumpkins. Doesn't this look like a school photo? Can you spot the naughty pumpkins in the back row? 4. I cut two slits on the top of my pumpkins. Then I strung my pumpkins together. Right now they're just smiling and dangling away above our table. Seeing their cute faces when I eat cereal in the morning makes me happy.